In Krav Maga we have no combat contact rules whatsoever. All parts of the opponent’s body, particularly the most vulnerable points, are a fair target and can be struck with any part of your own body and with any improvised weapon from the immediate environment. In Krav Maga we have no tournaments nor any fully competitive fights; any such competition would result in the serious injury to one of the combatants. As Richard Douieb, founder and director of the FEKM often reminds us, when we see examples of Krav Maga what we are seeing is a demonstration of some of the skills. Never the real thing. So in this sense Krav Maga is not an art and is most certainly not a sport. It is a highly effective self-defence and contact combat system designed to neutralise a threat against un/armed opponent/s in the shortest time possible. As the founder of Krav Maga, Imi Lichtenfeld (1910-1998) instilled in all his students, we train so that we may walk in peace. So you may be thinking now, as I did when I started on my Krav Maga journey, if there are no rules and if I can improvise with my own body and any environmental weapons, in what way can Krav Maga be called a fighting system? Now we get to the heart of what exactly is Krav Maga. Krav Maga was created my Imi Lichtenfeld for the Israeli Defence Forces in the late 1940’s and 1950’s. It is designed to be an extension of natural, intuitive body movement. It is designed to neutralise threats quickly in any reality-based situation. Krav Maga is designed around four core principles: simplicity, efficiency, directness and control. The four governing principles of simplicity, efficiency, directness and control drive all Krav Maga teaching and practice and define Krav Maga as a unique, modern, evolving and clearly identifiable self-defence and contact combat system. This is why Krav Maga proficiency can be achieved in a relatively short space of training time. We don’t learn hundreds of katas and forms – we learn a handful of principles that are taught and applied over and over again in a multitude of defence and striking techniques. When watching a trained Kravist fight, the four core principles of simplicity, directness, efficiency and control will be present in everything they do. And if they are not – it is not Krav Maga. And that is regardless of the situation (e.g. demonstration, Hollywood movie or real fight for survival), the combatants (of any age, gender, size) and the location (training club, night club, dark street). Imi Lichtenfeld studied the body’s natural responses to threat and developed Krav Maga around these rapid, instinctive, responses. This makes Krav Maga defences simple, intuitive and fast to learn. There are better looking martial arts than Krav Maga but few are as effective in real-life situations where there are no rules and anything can happen next. Each Krav Maga strike and attack takes the shortest, most direct route to the target. We don’t load, prepare or ‘telegraph’ any strike. The Krav Maga fighter will close the gap to their opponent very quickly and control the fight and the opponents body from very close range. We also train to use all parts of our body as ‘weapons’; fingers, fists, palms, elbows, head, knees, shins and feet. In Krav Maga we target the body’s most vulnerable points and physiological weaknesses. The objective is to end the threat quickly and decisively regardless of the opponents size and weight. We also practice something unique to Krav Maga, known as ‘bursting’ – defending and delivering the first strike in one single, simultaneous movement. We then continue to strike in a rapid, rhythmic sequence and we don’t stop until the threat is neutralised. Ultimately, perhaps the most important principle is that of control; rapid assessment of the situation, avoidance if at all possible and the use of appropriate and controlled force where exit is not possible. Our founder Imi Lichtenfeld created Krav Maga “so that one may walk in peace”3 and that philosophy is at the heart of all our training and all our actions. For now, happy training everyone. Is Krav Maga really a martial art? I am often asked whether Krav Maga can be called a martial art or even a combat sport. Good questions because, by responding, we can get to the heart of what makes Krav Maga the unique and highly efficient self-defence and combat system that it is. Let’s begin with the question of whether or not Krav Maga is a martial art. The answer is both “yes” and “no” because it depends on your definition of a “martial art”. If you consider martial arts to be centuries old fighting styles, often Eastern in origin and practiced today as a systematised sport, for example Aikido, Taekwondo, Jiujitsu and Karate then Krav Maga is not strictly a martial art. On the other hand, if you take a wider view of martial arts as any system of self-defence and combat and include the more modern forms such as MMA, then perhaps the combat system known as Krav Maga can be called a martial art, particularly at the higher grades. However, there are some important distinctions. In Krav Maga we have no combat rules whatsoever. 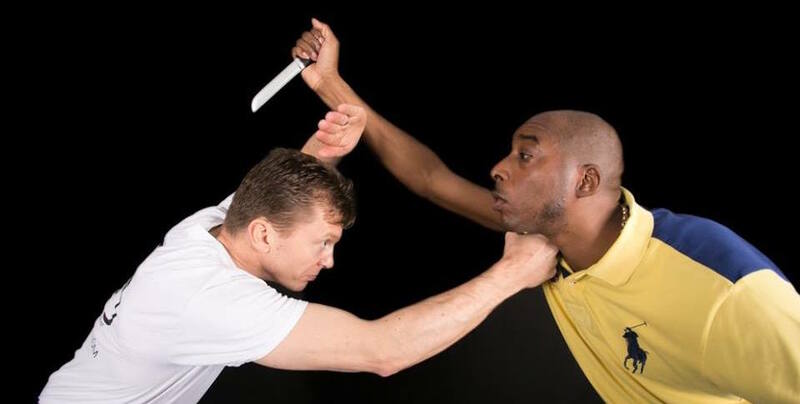 All parts of the opponent’s body are a fair target and can be struck with various parts of your own body and with any improvised weapon from the immediate environment. We also don’t have tournaments or real competitive fights; any such Krav Maga fights would result in the serious injury of one of the combatants. So in this sense Krav Maga is not an art and is most certainly not a sport. It is a highly effective self-defence and contact combat system designed to neutralise a threat against un/armed opponent/s in the shortest time possible. So you may be thinking now, if there are no rules and if I can improvise with my own body and any environmental weapons, in what way can Krav Maga be called a fighting system? Krav Maga was created my Imi Lichtenfeld for the Israeli Defence Forces in the late 1940’s and 1950’s. It is designed to be an extension of natural, intuitive body movement and it is designed to neutralise a threat in the simplest, fastest and most efficient way in any given situation. Krav Maga is designed around four core principles: simplicity, efficiency, directness and control. These four governing principles drive all Krav Maga teaching and practice and define Krav Maga as the unique, evolving and clearly identifiable self-defence and contact combat system that it is. We do not learn hundreds of katas or forms like other traditonal martial arts. For example, the ATA Taekwondo syllabus consists of 391 forms to Black Belt 1st degree! In Krav Maga we learn a handful of principles that are taught and applied over and over again in a multitude of strikes, defences and situations. This is also why Krav Maga proficiency can be achieved in a relatively short space of training time. So, for example, a Kravist will typically use the limb closest to their opponent to strike, will never prepare (or “telegraph”) a strike, will always strike using the shortest and most direct trajectory to the target, will target vulnerable parts of the opponent’s body (eyes, throat, solar plexus, groin etc. ), will press forward and close down the space to his/her opponent quickly and forcibly and will continue striking in a flowing sequence until the threat is contained. In our next blog we’ll talk in detail about the four core principles of Krav Maga and how they are applied at all levels of training and competency. Are you are getting the best Krav Maga training possible? So, you’ve decided that Krav Maga is for you. Excellent. But, you may have also know how important to choose the right training club. But why is that and how do you choose an excellent Krav Maga club? Let’s begin by exploring what is it that makes Krav Maga such a powerful self-defence and combat system. Firstly, it is a modern self-defence system. Second, it is direct, intuitive and fast to learn. Thirdly, ANYONE can learn Krav Maga – regardless of age, size or gender. It was created by Imi Lichtenfeld for the Israeli Defence Forces (IDF) in the 1940’s and is designed to be an extension of natural, intuitive body movement. It is also designed to be useful to people of all ages, fitness levels and gender. And it is designed to be simple, efficient, direct and controlled. In fact, these four governing principles drive all Krav Maga teaching and practice and make Krav Maga a unique, clearly identifiable and evolving self-defence and contact combat system. When watching a trained Kravist fight, these four core principles will be present in everything they do. And if they are not, it is not Krav Maga. Read our blog about the four governing principles of Krav Maga as a companion piece to this blog. For now, let’s focus on why and how to choose a great Krav Maga club. By it’s very nature, Krav Maga is physically demanding and dangerous. That means that when we train safety, control and injury avoidance must be a priority at all times. A good Krav Maga club will ask you about your physical health, any injuries you may have, your fitness level and why you wish to train before you start training. The instructor/s will have secure access to this information before your first class. Please don’t be put off by these questions. We are not being nosy or judgmental – we want to keep you safe, free from injury and appropriately insured so that you can train and have fun at the best of your ability for months and years to come. Secondly, in Krav Maga we practice and execute highly effective – and therefore inherently dangerous – techniques. Good Krav Maga clubs implement clear safety measures with every single technique taught. Safety is built into the instructors’ core teaching method – both for your own safety and that of your training partners. A good Krav Maga club will embody the values of Krav Maga and its founder; team work, inclusivity, humility and self-control. Thirdly, a good Krav Maga club will embody the values of Krav Maga and its founder Imi Lichtenfeld; inclusivity, humility and self-control. Imi Lichtenfeld created Krav Maga “so that one may walk in peace”1 and you will experience that philosophy at the heart of any excellent Krav Maga club. That brings me on to the fourth point. Is the club you are considering actually teaching Krav Maga? Sounds silly, right? This was something that was very important to me when I started my Krav journey and I’ll explain why. Is the club you are considering actually teaching Krav Maga? Choose a club that is part of a recognised international federation. Having “Krav Maga” in the name of a training club does not make it a Krav Mag club. There are excellent international Krav Maga federations that have direct lineage to the founder of Krav Maga Imi Lichtenfeld with high teaching and technical standards. For example, we are part of the FEKM (European Federation of Krav Maga under the direction of Richard Douieb, 6th Darga). Another good example would be the KMG (Krav Maga Global) under the direction of Eyal Yanilov. Finally, I would say choose a club where you like the instructors and the team, have lots of opportunities to train in any given week, where you can have fun and feel motivated and energised before each class. If you skip a couple of classes and miss your Krav – that’s a great sign. Students of Krav Maga often ask how they can improve their Krav Maga skills, timing and balance during sparing and combat. And the number one answer is, by improving their core body strength. Oh, and doing some yoga. Krav Maga is an exceptional self-defence and contact combat system. I call it the “combat equaliser”. Why is that? Krav Maga is designed to give any trained person, regardless of age, gender and size, a real edge against bigger, stronger and armed opponents. And Krav Maga does this with stunning efficiency. But of course, as with any physical skill, the more you practice and the more skilled your instructors and team members, the better you get. That almost goes without saying. However, there are a few things that you can do that will really support and supercharge your Krav Maga training and technical ability. Firstly, focus on core body strength and secondly maintain and extend your body’s flexibility. We’ll talk about flexibility in future blogs. For now, I want to look at the relationship between Krav Maga and core body strength. What does core strength mean? It is defined as strength in the underlying muscles of the torso. This would include the abs, the hips, the pelvic area and all the muscles stabilizing the spine. So, why is core strength important for Krav Maga and why do we focus on it in our training? Almost every gross motor skill we apply in Krav Maga is driven by the torso. That includes punches, elbow strikes, hammer blows, knee strikes, kicks and even aspects of chokehold releases, pinned-to-ground releases and weapon disarmaments. Once you are trained to use your body weight effectively and tactically in Krav Maga, paired with some core strength training, you will experience exactly why Krav Maga is such an efficient self-defence system and why a relatively small trained woman can prevail over an adult male attacker. The second benefit is that improved core strength will give your Krav Maga movements stability and balance. You will be able to strike with precision and recover to exactly where you want to be and ready for the next strike. And thirdly, with a little attention to core strength you will enhance your ability to flow from one strike to the next in a smooth, relentless sequence that is characteristic of Krav Maga. In fact, this is a defining principle of Krav Maga and it is called “retzev”. I’ll be talking more about Krav Maga gross and fine motor skills, the benefits of flexibility training (yes, I do mean yoga) and what happens to the body during the stress and adrenalin rush of a real fight in future blogs. For now, get going on those crunches, side planks, pushups, sliding pikes, oblique reaches and spider lunges. Include both static and dynamic core strengthening exercises as they serve different purposes. 15 minutes a day, 3-4 times a week and you will see the benefits almost immediately in your Krav Maga.